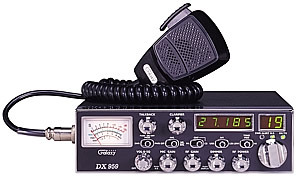 Basics: 40 channel AM/SSB CB radio with a 5 digit frequency counter, SWR alert indicator, RX/TX indicator, roger beep, side mic jack, talkback, variable output power, automatic SWR circuit, and Galaxy noise filter. Controls: Volume, squelch, mic gain, RF gain, variable RF power, dimmer, talkback volume control, and clarifier. Switch functions: Mode selection - AM/USB/LSB, switchable meter functions - SWR and PWR, NB on/off, ANL on/off, Galaxy noise filter on/off, CB/PA, and tone hi/med/lo. Dimensions: W 8" x D 9.75" x T 2.5"
Notice:For Citizen Band Radios: Internal modifications of any type void type acceptance granted by the FCC. If you intend to operate a modified transceiver within the Continental United States you may be in violation of Part 95 of the FCC rules and regulations. We recommend reading and familiarizing yourself with part 95 of the FCC rules and regulations before operating a transceiver.